Following the demo, prepare a one to two page executive summary. It must be delivered within 24 to 48 hours of the demo to keep the prospect involved and maintain momentum. Short Meeting Summary: Highlight the most important takeaways from the meeting. Prospect Company Profile: Provide key details about their company that apply to your solution. About Your Company: Share important points about your company that relate to your prospect’s needs. Summary of Needs: Identify the list of the business challenge(s) your prospect is trying to solve. Features: List key product functionality that matters to the prospect. Benefits: Explain how it will make their job easier. Advantages: Communicate why your solution is better than the next best alternative. Pricing: It’s a good idea to share pricing early in the sales process. You don’t want to get deep into the sales process only to lose the deal on price. Next Steps: List the details for what both parties agreed to deliver and include the next meeting date(s). Your next meeting should ideally come just a few days following the submission of your executive summary. Most companies have multiple stakeholders involved in the decision; you want to get involved with all of them. Deals often stall when a key stakeholder hasn’t bought in due to his or her limited involvement in the sales process. Work with your primary contact to set up meetings with the decision maker and other influencers and apply the skills you learned for running effective sales appointments. As you did following the initial meeting with your primary contact, it’s a best practice to also provide an updated executive summary to the stakeholders you met with. After you and the prospect have reached alignment on identified needs, recommended solutions and pricing, prepare and submit an Agreement. Make sure you schedule a meeting within one or two days to review the Agreement. Deals stall when salespeople make the mistake of sending the Agreement and waiting to hear back. I’ve seen reps send a contract and wait one or two weeks before following up. Lock in an Agreement review date to keep the deal moving forward. Contract approval can take time, especially in a competitive situation. So, what can you do to keep up the momentum? 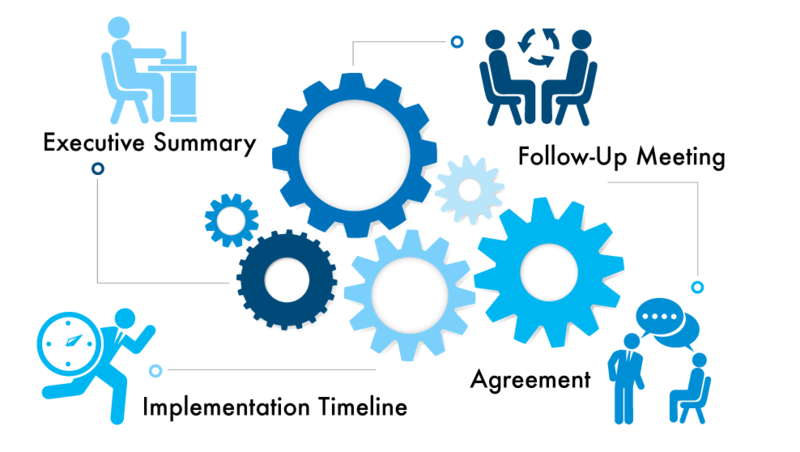 Prepare an implementation process and timeline to share with the appropriate stakeholders. It’s a great way to keep the prospect engaged, set the stage for next steps, and avoid bottlenecks once the Agreement is signed. Key Tip: Make the process look simple. Sometimes, no matter what you do, decision makers are reluctant to move forward. Here’s a list of tools and tactics you can use at any time to get prospects over the hump. Projected Results - Buyers often want proof that your solution is going to work. Use ROI Calculator tools to project results and, if your company is willing, put together a set of reasonable high value goals and offer a performance guarantee. Market Research - Use market research to share the trends and statistics that impact your customers. Tie your proposed solution back to how your company can help solve the problem. Case Studies - Case studies are a great way to show how your solution has worked for other customers. The best case studies tell a story, maintain a focus on the customer, and demonstrate a history of success. Testimonials - Word-of-mouth and referral marketing are among the most powerful ways to provide social proof. Gather testimonials from prospects and social media channels and leverage them throughout your website, marketing campaigns, and sales follow-up process. Incentives - It’s commonplace in the software space to offer discounts, waive set-up fees, etc. It’s a best practice to offer these incentives with a short-term deadline. Some people believe they have a long sales cycle because it’s the status quo in their industry. Others will tell you that sales has no control over timing and that buyers control everything. Although there may be some truth to both statements, as a salesperson, I’m not willing to throw my hands up and think I can’t make an impact. When sales and marketing teams align to execute on the steps outlined above, you engage customers at a higher level. It’s about making your solution a priority. Priorities supersede the status quo and make for perfect timing!